Louisa Harding is our feature interview guest for Episode 59. Louisa is a formally trained designer who has written and designed for top magazines and Yarn brands. 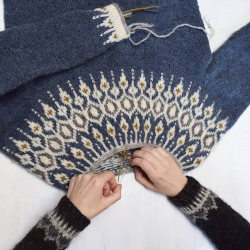 We also feature Anne Hanson from Knitspot in New Releases, there is a short tutorial from Andrea, updates on our projects and we announce the winners of the Vintage Shetland KAL prizes. After being formally trained in textiles and design, Louisa was a major designer for Rowan for 17 years. She also created ready-to-wear collections for Europe, the U.S. and the Far East and in the late 90s Louisa became the brand coordinator and designer for Jaeger Handknits. 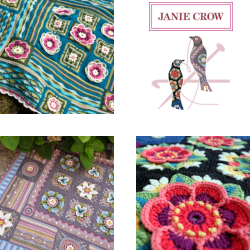 She writes and designs for many magazines including Vintage Style and Vogue Knitting and many of you will recognize her name from the Louisa Harding yarn collection. 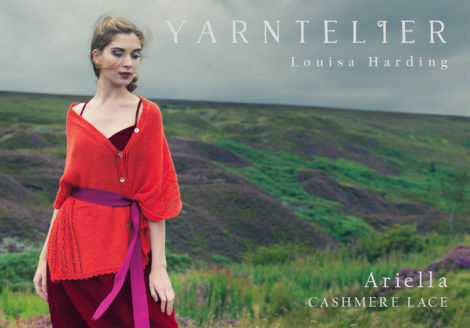 More recently Louisa, together with her husband Stephen, has set up her own independent design studio and yarn brand – Yarntelier, in Yorkshire. 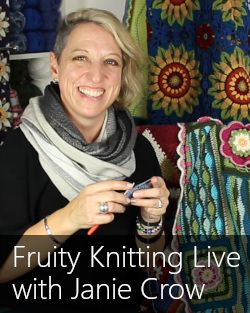 Louisa Harding is offering Fruity Knitting Patrons a 10 percent discount on yarns, kits, gift packs, books and digital patterns from her online store. This offer is valid until 7 September and you can find full details here. 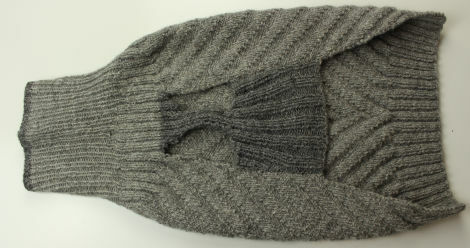 In the Aspergillum top, Anne has reproduced the stitch pattern she saw in a machine knitted design, to amazing effect. 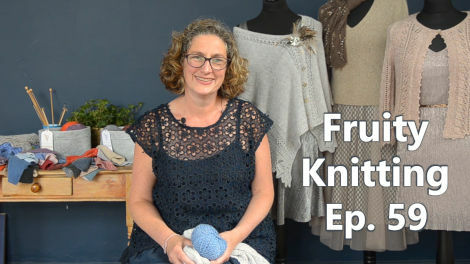 It’s looks complicated, but Anne has assured us that it is just a collection of well-known stitches and should be manageable for the reasonably skilled knitter. 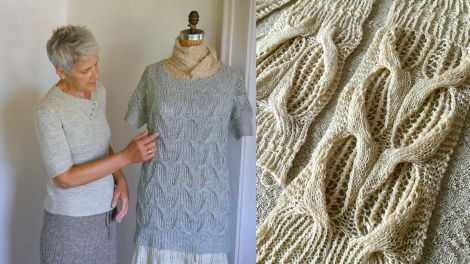 We love the inspiration for the name – Euplectella aspergillum, a deep ocean sea sponge also known as Venus’ Flower Basket, whose curves are reflected in the stitch pattern of Anne’s beautiful top. The sponge consists of glass fibers which are woven together to create a extremely strong structure, which often serves as home to a pair of shrimp, who live with the sponge in a symbiotic relationship. Pass that on when someone complements you on your new top! 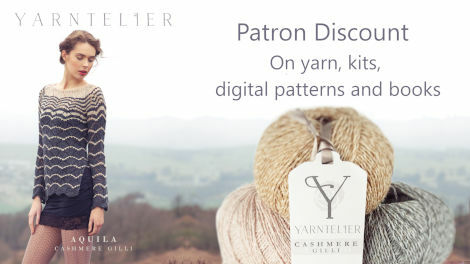 Anne is offering Fruity Knitting Patrons 50 percent off her Aspergillum pattern and 15 percent off any purchase of two or more skeins of the recommended Fresh Lace yarn. This offer is valid until 31 August and you can find full details here. 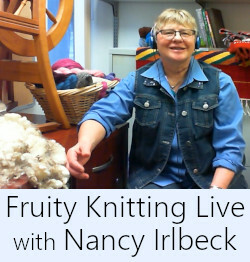 Many thanks to Anne Hanson of Knitspot and Bare Naked Wools! This jacket started off as one of the pieces (front or back) for my vest – the Whelk by Martin Storey. 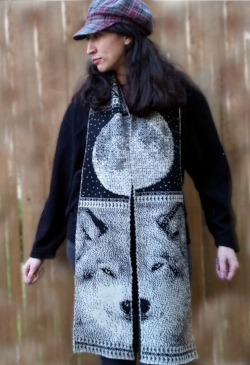 Unfortunately I knitted it on the wrong sized needle, so it was going to be too small for me. Instead of ripping it out we had the idea of creating a jacket for Jack. 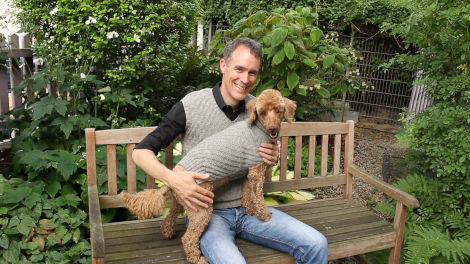 Although it’s really hot right now, we do like to go walking when it’s cold, and when it’s below freezing, we figure Jack can have a little jumper in addition to his own coat. I think Andrea did a great job, and Jack and I are going to look splendid together! 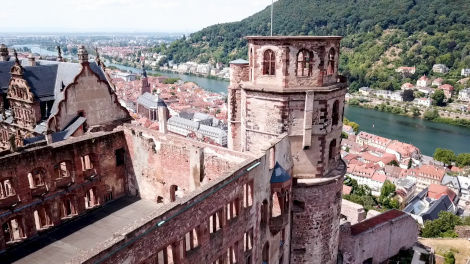 Heidelberg may be the most popular tourist destination within Germany, and not without reason. It has all of our criteria for a good day – hill, castle, river, and, after a lot of walking about, coffee and cake, or maybe something more substantial. Hiedelberg Castle, looking down to the gothic church and the city. When we first moved to Germany I had committed to my employer to stay for a year, but beyond that we had no fixed plans. So we did lots of touristy trips, at that time without a car, and normally with Madeleine, who was one year old, in a backpack. One weekend, probably in 2000, we decided to do a day trip to Heidelberg, so we set off on the ICE – high speed train. We had a great day, enjoying the castle, river, hill, coffee and cake. Rada Café and Rösterei (roaster). 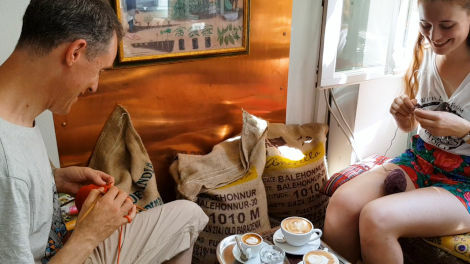 This place is tiny, but the coffee was excellent. As we were getting off the train, back in Frankfurt and somewhat weary, Andrea said, “Where’s my purse?” We figured it must have been left in the cafe. We went home, rang the cafe, and yes, it had been found and handed in. We checked the train timetable and off I headed, back to Heidelberg, for the second time that day. Fast trains in both directions, should be fine. In Heidelberg, I took a taxi from the train station directly to the cafe, ran in, gratefully received the purse, and raced back to the station in the taxi to catch the return train as carefully planned. I needn’t have hurried. The train was late – happens even in Germany. The wait became longer, and longer, with occasional announcements, and then eventually we received the information that there were trees on the track, storm damage. Sometime later we were told that there were buses which would take us to Frankfurt. I arrived back in Frankfurt around 3:30 am. Heidelberg, worth a second visit. 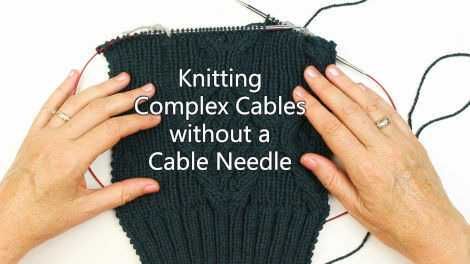 Andrea has done tutorials on working simple cables without using a cable needle but some cables have multiple maneuvers. Nevertheless you can still do them without using a CN. 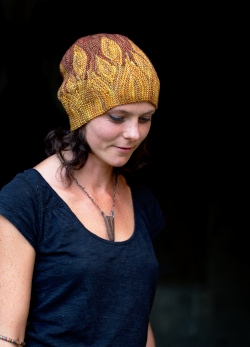 This is Andrea’s personal preference because the flow of the knitting is less interrupted. We hope you find it useful! Patrons can access the individual tutorial here. I’m making good progress on the Carbeth Cardigan. This will be for Madeleine, but Andrea is already making noises suggesting that I should make one for her. The heavier yarn means that that is not entirely out of the question. The leaning decreases are fun. I’m looking forward to having Madeleine try it on! Your podcasts are consistently informative and delightful. I am most grateful for them. I hesitate to suggest this since there is no way I can take it on (in fact, wouldn’t know where to begin), but an index of all your comments, interviews, and tutorials would be wonderful. Is there anyone out there who could do this for you? You can click on those links, and you’ll get a list of all the posts that were “tagged” with those topics. It’s hard to be completely consistent with these tags (I saw there was only one page tagged with “Hiking Jacket”), but we try. Well, that should work perfectly. I should have realized that this amazing community would have worked this out. Hi Cindy. 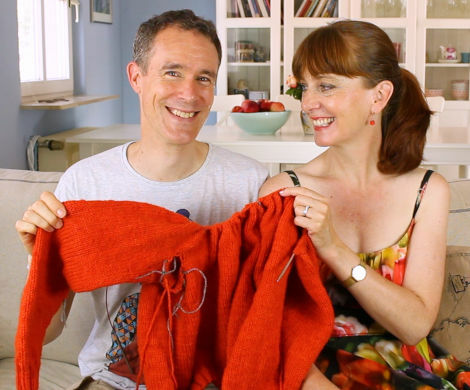 You can hear about the cardigan in Episode 57. I seem to have lost track of the KAL links as well as the extreme knitting photos. I’ve been searching and clicking to no avail so now I must ask for HELP?? Never mind..why didn’t I think of Ravelry? I found them. I can’t view episode 59 in the US – youtube has blocked it for some reason. I would like to see how you do the cabling. Hi Jen. Thanks for letting us know about that. We will look into it – give us a few days and try again. A + A.